For Kristina Werner's 50th color challenge, I tried something a little different than a card. This is actually a refrigerator magnet (although a rather large one at about 7" in diameter). The photo was taken last summer when my stepdaughter, Jaime, who is now a stem-mom herself was playing around with her kids, Dillon (right) and Nai Nai. Jaime is a terrific mother and I wanted to send her a little something for Mother's Day. To stick with the brown, red, yellow, turquoise, and yellow pallete, I printed the photo in sepia. The frame is a large chipboard scalloped circle from Stampin' Up inked in Riding Hood Red and Basic Brown. Actually everything is Stampin' Up except one brad and and the tag. The largest flower is done with poppin pastels technique in Summer Sun and Ruby Red and all other flowers are stamped and cut out. I embossed one of the buttons in turqoise to give it a little more texture. This was really a fun project and a break from cards and scrapbook pages. 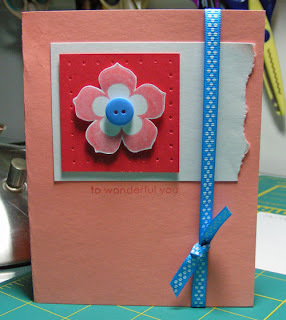 Ingredients: Stamps: Petal Pizzazz, All Holidays for greeting, One of a Kind for embossing button. Ribbon: So Saffron from SAB 2009. Welcome to to my first TIPsy Tuesday! No alcohol is involved, I promise. Unless of course we can figure out a way to use Margaretta Mix in a cool stamping technique. Seriously, every Tuesday I’ll post a Tip, Technique, or my take on a Tool you can use in your paper or fabric crafts. To kick things off, I’m going to do 2 tips this week. First off, ribbons. We all love putting ribbon on our cards. Correction, we love having ribbon on our cards; but getting it to stay on and look pretty can be a fuss. There are several techniques; more will be covered in coming weeks. Today, I’m showing you something really simple. To get the ribbon to look pretty and stay put (and I’ve handled this sample a lot so I know it stays put), is very easy. Plus we are only using a small amount of ribbon. This works particularly well with thicker ribbons that are hard to tie in double knots. 1. Cut a ribbon 5" and tie a single knot. Trim the ends as desired. 2. Position the knot however you want it to be on our card. 3. Slip glue dots under the ends – not under the knot. You can put a glue dot under the knot if you want but it isn’t necessary. 4. Press lightly to keep the ribbon in place. Too much pressure will make the glue dots stand out under the ribbon. If you have a very light weight ribbon, place your glue dot under the knot and use a little glue stick under ends to keep it in place. My second tip is for ink distressing the edge of paper. For Stampin’ Up! customers, use Sahara Sand for a beautiful natural color to add an aged look to your lighter papers. I used the color here on this white tag. When distressing the edge, hold the paper steady and move the stamp pad over the edges. Put a little more ink on the corners. For darker papers, Basic Brown works well. We often focus on the basic 48 colors and the In Colors. Don’t forget to work those neutrals! Could you use a night out? My next Stamp-a-Stack is Monday, May 11 at my house (5:30 – 8:00). We will make 10 cards total – 2 each of 5 designs. The theme is All Occasions. We will make this “Loads of Love” card and a “A Little Birdie Told Me” design for Get Well/Thinking of You. Also, we’ll do an elegant Sympathy card, Thank You, and this Congratulations card which you can stamp for weddings, births, all sorts of events. I’ll show you now to turn the Congrats card into a gift card holder. Please e-mail or call to register by May 1. Cost is $15 which includes all materials including envelopes for the 10 cards and a light meal before class. You also get a fun night out! Celebrate Earth Day by looking through some of the nature photos you have taken. 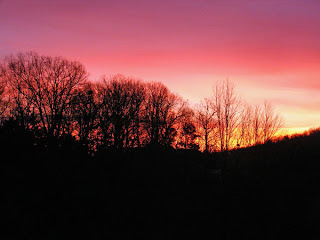 This is one from my front porch at sunrise. This card is a little on the busy side for me. But I didn't make it for me; I made it for a special boy in our lives. Our grandson, Dillon, turns 8 this week and this wish is on its way to him in Missouri. I was reminded of an important lesson in using chipboard while making this card. Like paper, chipboard has two sides. Depdending on the design, if you don't like how one side comes out, you can just flip it over and start inkng and stamping again. 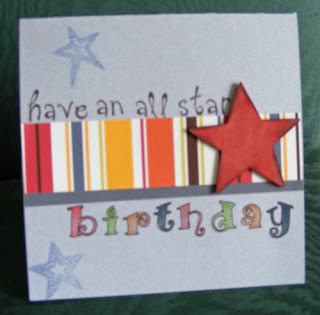 My first take on this star was a Summer Sun background with Ruby Red polka dots. Yeah, it looked like part of a clown's costume. Way too young for Dillon. His favorite color is red so I turned it over and started again, keeping it simple this time in Ruby Red with chocolate distressing. All the words are stamped. I outlined the word "birthday" with dark brown marker. Doesn't this layout make you want to head to the beach? A cruel thing to post on a Monday morning, I know. Yet, this is one of the many benefits of scrapbooking. Seeing your pictures and journaling brings it all back. Soon you can smell the ocean, feel the sand between your toes. Oh, enough, you get the idea. I did these pages this weekend using both digital and traditional scrapbooking. The combination is called Digi Fusion. A form of digi fusion is how I've always done my scrapbooks. I'm one of those crafters who hates her handwriting and with good reason. My second grade teacher announced in front of the entire class that my handwriting looked like 'chicken scratching.' I learned to write in cursive the next year and things didn't get a whole lot better. So I use my handwriting sparingly and type my journaling. In my early scrapbooks I would sometimes print out clipart for the pages. Then I would put it all together on the pages in a traditional scrapbooking way. Having tried some all digital pages, I'm not sure I'll ever be a complete convert. I still like the textures and true depth of traditional pages. I added stitching to one of these pages for an embellishement. Yet, I loved using entire photos for backgrounds on the pages above. Some of the photos on the right page were printed with the background. Some I printed separately and used dimensionals to adhere. In person it looks like three different layers of depth. 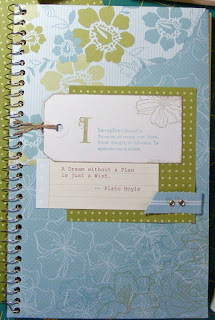 So for now I'll enjoy the best of both worlds - digital and traditional scrapbooking. Less than 30 minutes. That's how long it took me to place on my painted wall these Eastern Blooms Decor Elements in white, playing with a couple of different arrangements, adhere them and clean up. Basically the clean up consists of throwing away the peel off materials and carrying the step ladder downstairs. That's my kind of clean up. 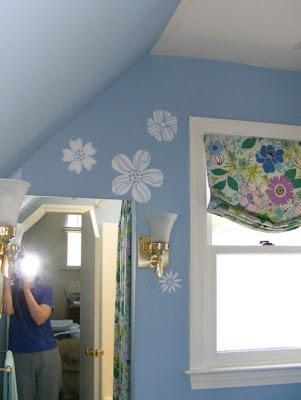 Wall art that accentuates my fabrics and the clean white trim of this attic bath for around $15 in 30 minutes! Vinyl wall decor called Decor Elements from Stampin' Up! stays up as long as I want it to and it can be removed if I later decide to change my decor. I spent days removing the old wallpaper but I tried a sample of this and it came off easily. This is my favorite time of year! I love Spring. It's starting to get warm, the bugs especially the mosquitos are still sleeping, and the colors are starting to pop. It is like the intensity has just been turned up on everything. Grass is green again, trees and shrubs that will soon be green for summer are bright yellows, pretty pinks, and sparkling whites. Gee, am I Mary Poppins? Anyway, this is all a build up for why I've not been posting cards. I've been outside planting flowers. Last night, I did pull out a few things from my scraps drawer. 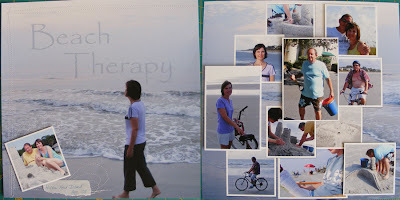 On this card, I had already stamped and mounted all the images on the mocha color. So it was simple to finish up. When the new catalog came out in January, I instantly fell in love with the wheel "Funky Forest" used here to make the trees on this card. I just couldn't quite figure out on my own how to use it best. I got this idea from cards I saw on Splitcoaststampers.com. The trees are rolled on in Certainly Celery and then I colored over the trunk and branches in brown marker. Simple, why didn't I think of that? This card is also a good example of how all the Stampin' Up! products go together. There are only two colors used here: Certainly Celery ink, ribbon, and cardstock along with Chocolate Chip ink and paper. Quick, effective and everything matches beautifully. 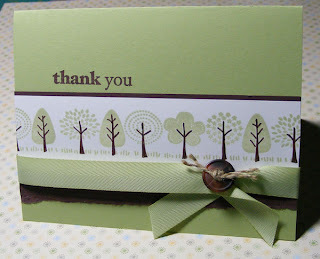 I also used the 'thank you' from a discontinued set: Spring Solitude. Lately I'm getting a lot of inspiration and instruction from various blogs and web videos on stamping techniques. I watched one at Stamp TV on emboss resist, a technique I've done before but thought I might learn something new. One thing the presenter suggested was trying this technique on pattern paper. The stamped image above is embossed in Close to Cocoa on a simple dot paper. Then I sponged So Saffron and Soft Sky (last year's in color) over it. I did two versions one with Saffron in the center and one with Sky in the center. I liked both. The effect is suble but enhances a simple image. I filled out the rest with scraps and some of that great So Saffron ribbon from this year's Sale-a-bration catalog. I hope they offer ribbon and paper every Sale-a-bration, this year's choices have been so versatile. Stampin' Up! 's new line of Decor Elements aren't just for wall. Seeing this element on my laptop makes me smile. It is one of the elements of the Eastern Blooms set of Decor Elements I got to put on my bathroom wall. I plan to use all the others in the bath but I really thought this one looked great on the laptop. 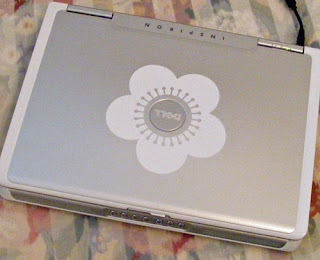 I got the idea from my upline's upline who has added an element to her laptop to distinguish it from her husband's (they have exactly the same model.) Great idea, huh? Decor elements are self-adhesive vinyl art that coordinate with other Stampin' Up! designs. They can be removed but not reused. They are an inexpensive way to spice up a wall, a piece of furniture - all types of surfaces in many styles and colors. Last night I made 4 of these cards using one of the samples from the Stampin' Up! Spring 2009 catalog as inspiration. When I finished the first one, I had a big smile on my face. I love the color combination of turquise, Ruby Red and Cameo Coral. As I just wrote in an e-mail to my customers and friends, taking a few minutes to make a card at the end of the day brings such a feeling of accomplishment. No matter what else happened during the day, you have something tangible and beautiful that you have made. Paper: Whisper white and an assortment of paper from unknown sources. Ribbon: From a fabric store grab bag, source unknown. The color challenge colors this week are Kiwi Kiss, Baja Breeze, Chocolate Chip and White. These are the perfect popular colors to show you how Stampin’ Up! 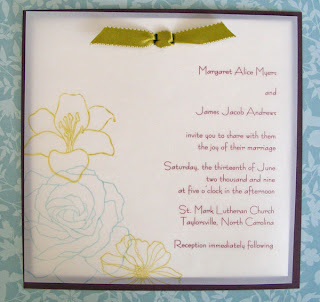 products can be used to make your own wedding invitations or some for a friend or relative. These came together amazingly fast. The invitation is printed on white velum with white and chocolate chip cardstock as background. The text is printed in a font color I worked out to match the chocolate chip paper. Then the flowers are stamped on. The double sided Kiwi and Vanilla ribbon makes a beautiful flat bow to complete the 6” square modern invitation. 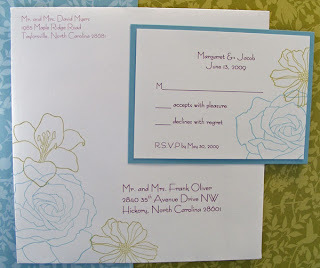 Using the same stamps and colors allows you to match your invitations, reply cards, and envelopes. Of course the color choices could be customized for the wedding colors. This is just one example of how a stamp set and the coordinating inks and papers create unique, custom wedding stationery. Plus, there are so many other paper crafts that can be coordinated using these same stamps and papers for favors, thank you cards, place cards. The bride or her family can save a great deal of money, plus get a more custom look for the wedding. If you know of a couple getting married, please send them a link to this posting. Have them give me a call for more info on how to create their own stationery. I offer services anywhere from sales, to designing the stationery, to making the entire package. Ingredients: Stamp Set - Fifth Avenue Floral by Stampin' Up! 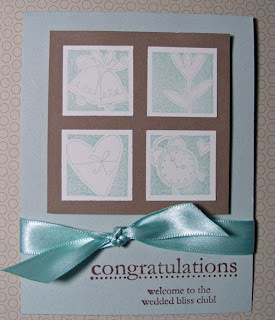 Card Stock: Baja Breeze, Chocolate Chip and Whisper White by Stampin' Up! Ribbon: Kiwi Kiss/vanilla by Stampin' Up! 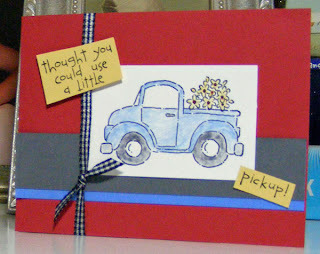 Have a fun night stamping with my supplies and leave with 10 complete cards and envelopes. You will make two each of 5 different designs. Everyone needs “Get Well,” “Thank You,” “Sympathy,” and “Congratulations” cards in their stash. 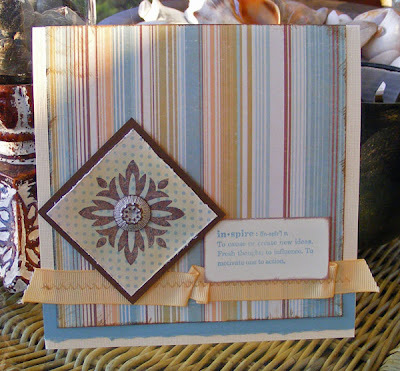 Cost includes Kindred Spirits stamp set (p. 86 in the catalog) and half pack of Urban Garden (p. 159) designer paper. This class starts at the beginning of the card making process. 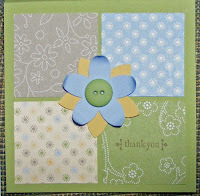 You will mount your new stamp set, design a card, learn how to determine sizes for cutting papers, stamp, and assemble. 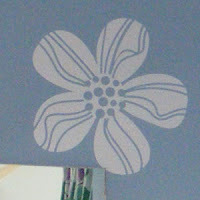 We will take one card all the way though the process and then create 3 more items using pre-cut papers. This is a great class to get started in stamping or to pick up tips on design and construction. You will leave with at least 4 cards, a versatile stamp set, all-purpose designer paper, and many ideas for how to use your new stamp set! All classes will be held at my house. Please give me a call or e-mail to register. A few weeks ago a customer called and asked for gold sheers. My first thought was the type of sheer on the far right of this photo, a plain voile fabric colored gold. Then I quickly thought of all the beautiful patterned sheers I have and our choices opened up extensively. We looked at other solids but with some texture to them in various shades of gold. Her final choice was the diamond printed sheer on the left. It has a little texture and shading in the fabric and the diamond print is embroidered. I'm working with this fabric now and it is just beautiful. I can't wait to see them installed. One of the other benefits besides the beautiful pattern and texture is the weight. While the fabric is still technically a sheer and will be unlined, it is heavy enough to hang alone without draperies - just what she wanted. When you have a sliding door, french door or large window to cover, consider using sheer panels rather than draperies. You can draw them to filter light or let them hang in panels on the side. Sheers come in a wide range of colors and patterns adding a light, finishing touch to the room. Yesterday marked 12 years in the window treatment business! Wow! Even in this recession, I am so fortunate. I have great clients who I've come to know as friends. The projects keep coming always with new challenges. No two jobs are never alike - different kinds of windows, different fabrics, different treatment styles all add up to a new project each time. So the job never gets boring. I'm very fortunate that I can work out of my home. This morning I cut fabric and pressed in hems, now I'm updating the blog, and in a few minutes I'll be fixing lunch for my husband and myself. It is a great luxury to have a meal together each day before we return to our tasks. I have a lot of flexibility in my hours yet I really try to meet my clients needs. I remember what it was like to work set hours and only have nights and weekends to get anything done. It is very frustrating to need something only to find the store closes at 5 or 6. I've always taken appointments in the evenings and weekends. Also, I've been able to expand when I wanted or needed to and to pull back and do other types of work as they came along. When I started 12 years ago, I was a full-time corporate employee, then a contract trainer. I also worked for Pro-Tint as a sales rep. Then I went to design school. The constant has been this business. One of the best things is being creative every day. I love to create beautiful things. While I might get frustrated sometimes trying to figure something out, I do like to solve problems. It is so gratifying knowing that there is a way to make whatever we need to do work. And of course I could not do this business without my husband, Lenny. He staples, he helps install on the big jobs, he lugs bolts of fabric to the basement. He helps me figure out some of those seemingly impossible situations. He is great! It feels good to count my blessings. I really have a great job! There are trade-offs of course. There is more lucrative work out there, but I love doing what I do. Thank you all for helping the business grow over the last 12 years. I look forward to continuing all my creative projects with you.